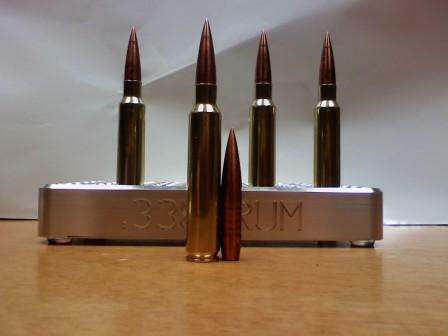 Quote Reply Topic: 310GR .338 buldozers. Sunday night me and a buddy meet at the land to move a target and see if we could get 1,000 yards. We moved it and were able to get 1,004 yards pretty easy. 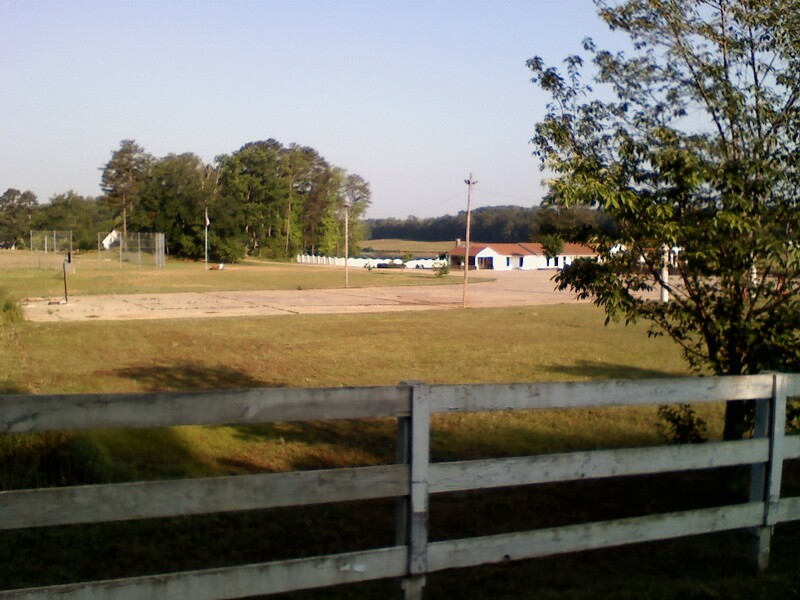 So Monday morning we meet at 830am and got things unloaded and set up. The sun was at our back and it was 70degrees sunny and really humid with very little (3 to 4 MPH) wind from left to right. I’m shooting across two lakes and a lot of field. 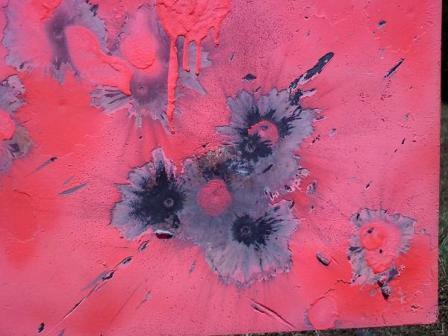 Normal view.of target up close 16x16 steel plate. This was normal view thru camera. you can see the orange dot to the left of the building . I loaded up my go to load with a 300gr berger with 89.5 of retumbo and let her rip. It hit the top left of the target. I'm pumpped as it was a one shot hit at 1,004 yards. I have not played to much at 1,000 but It was a good and very lucky day I guess. I missed my second shot high and was hit and miss for a few untill I got my stuff settled down. I got my buddies son who is 13 to shot one off and he had a 1 shot hit my cousin who is 13 also had a 1st shot hit. They were pummped. after 40 rounds of hitting the steel at 1,004 yards and letting the rifle cool, I broke out the 310 buldozers to see how they will shoot. I would hate to have wasted them on a group at 100 or even 200 yards. so WHO NOT run them now at a longer range. 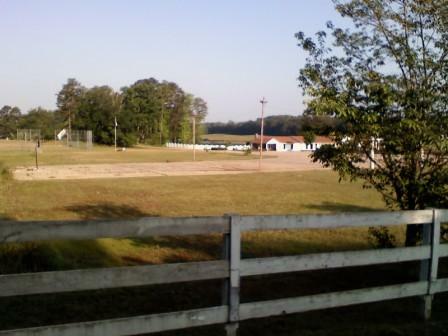 The first one shot over the target into the bank. I dialed down to 25MOA to see if I could get them on target. 2nd shot feel just short of the plate. I dialed up to 26MOA even. This was the final 3 shots of the buldozers. 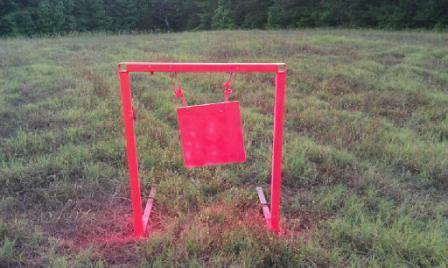 It is a 16inch x 16inch square and i'm guessing a 4 inch group.Not bad for a rookie shooter like myself. It is the 3 black dots. I think trigger29 is on to something with this bullet. It took less MOA and weighs 10gr more. I was Happy with the group and out come of them up to this point. By no means am I a pro at this shooting stuff/loading stuff. I will say I am lucky from time to time and this might have been one of those times, but I will take it. Here is a few random pick of the Buldozer in some camera pic's I took while loading. Sorry about the wide picture but you wouldn't be able to see the dot if I shurnk it. I like the pink target... is there a hidden message there? No, I added the "Litz Knots" program to my ballistics chart. NO, Its just shaved a little lower than normal. Its all there. Target has a great "RING" to it, doesn't it?? Nice shooting... the first shot was the only one you needed. You could hear it? Can you post the video? Was that your first time? Is THAT why the target is PINK????? Dude!!! The target is not PINK it is flat orange. The sun is at an odd angle. The paint is what you use to mark underground untilities with. It was free. 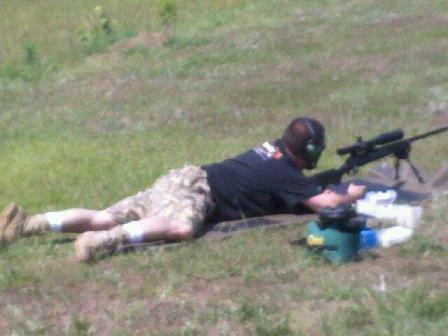 Oh yes the first shot on the video was my first ever @ 1,004 yards couldn't you see me smiling? I need to get me some of those bullets. 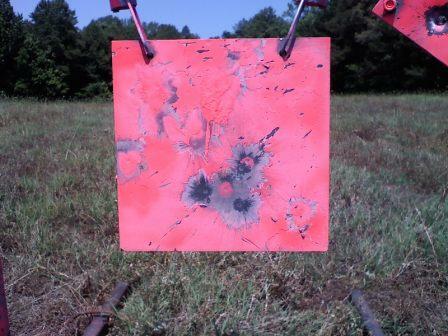 and all the sweeter with the pink .... er .... flat orange targets. That was great but can you do it again?? Gentleman!! Who is this guy kidding!? And I don't know if I'm any good as a bulletsmith, but I've been known to be lucky once in a while.....As well as too stubborn to give up. In all seriousness, Nice write up, and nice shooting. Thank you so much for your help. Now that I know they will stabilize, I'll finish cutting the rest for the rest of the testing. They should be headed your way soon. 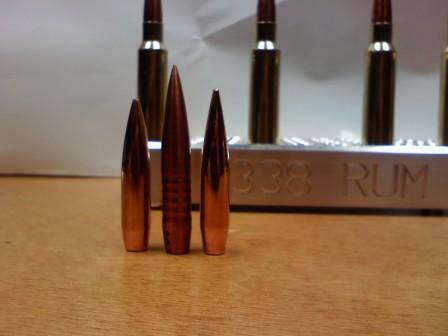 The .308's are all but done already. 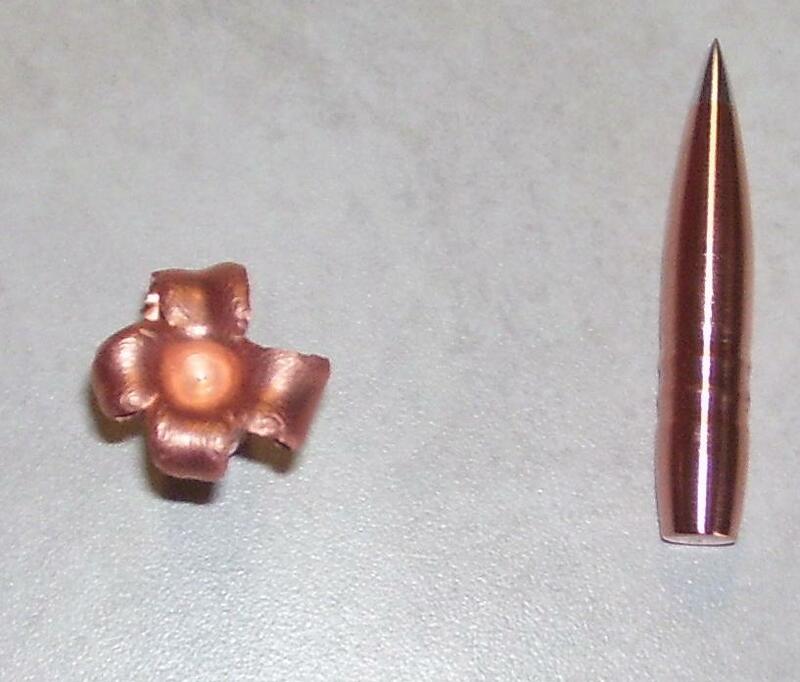 I have a solid match bullet, and a hunting version. .277's have just begun testing, and 6mm is next on the list. Then I'll be moving to 6.5, and 7mm. 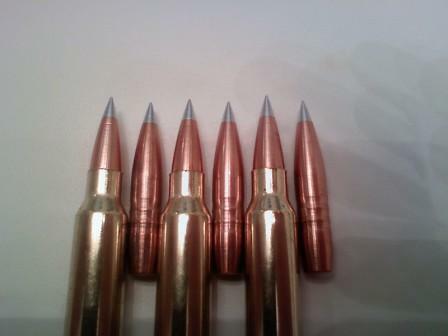 Then some BIG calibers. 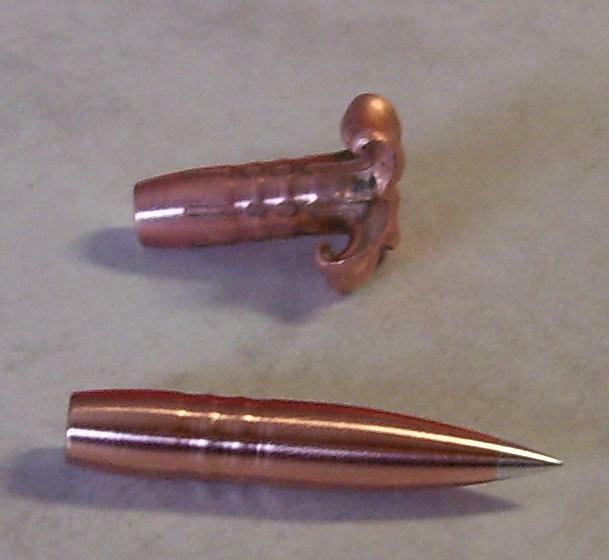 Before, and after firing into ballistic gel. A 1-10" twist would be an absolute minimum at .308 velocities, and even then they may not stabilize. They work well with a 1-10" at .300 win, or Wby velocities. 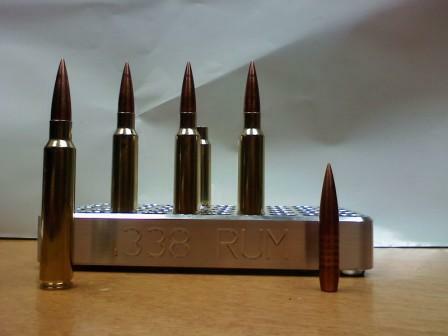 Hmmm... BIG calibers... like, maybe, like .458???? ?